Offering the chance to view one of the world’s most breathtaking landscapes from the comfort of luxurious accommodations, an Antarpply cruise is truly a once in a lifetime experience. On board this Antarctica cruise, you’ll join a very exclusive group of adventurers who have journeyed to one of the harshest climates on Earth. Specially strengthened for the icy waters of the Antarctic, the USHUAIA is luxuriously appointed and outfitted with all the comforts of home. Choose from cabins ranging from opulent Suites and Superior cabins to more budget-friendly Class A, B & C cabins. Outside cabins are available in most ranges, allowing you to view the breathtaking scenery from the privacy of your living quarters. Comfortable beds and private facilities are all included. On board, you’ll enjoy world-class dining, together with many local specialties. Other perks include a large dining room, bar, library, conference room with state of the art multimedia facilities, an observation lounge with spectacular views and a small infirmary for peace of mind. Each of our expertly designed itineraries has been created with guest experiences in mind. Choose the Antarctica cruise package that complements your previous travel experience and interests. Our friendly customer service personnel are happy to assist you in choosing the ideal vacation package. For those craving an introduction to this incredible part of the world, our Classic Antarctica itinerary is the perfect pick. 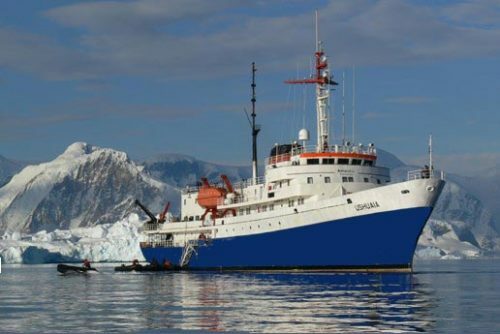 Ideal for first-time Antarctic travelers, this tour offers world-class views and frequent trips – typically two per day – via Zodiacs, tough inflatable craft ideal for venturing onto land. You’ll visit penguin colonies and international research stations, as well as glimpse a wealth of wildlife including various species of whales, penguins, seals and sea birds. The Classic Antarctica cruise lasts about eleven days, beginning and ending in Ushuaia, Argentina. Ideally suited for those who crave the adventure of crossing the Antarctic Circle, the Polar Circle Quest is a twelve-day tour which begins and ends in Ushuaia. Weather permitting, you will journey across the Antarctic Circle, joining a small and exclusive club reserved for those who truly love the frozen South. The Polar Circle Quest is expertly designed to take advantage of weather and wildlife conditions, offering a spectacular visual display. Perhaps most famous for the ill-fated Shackelton Expedition of 1914-1916. We offer an incredible experience with a far happier ending, touring this spectacular land and waterscape from the safety of our ice-strengthened ship and tough Zodiac boats. This tour offers some of the most beautiful scenery in the region, including ice-filled channels, bizarre tubular icebergs and soaring mountain ranges. Wildlife is plentiful and varied, including several species of penguin colonies, whales, seals and sea birds. If you prefer your island-hopping with a frozen twist, you’ll love our Classic South Georgia tour. This twenty-day itinerary takes you to the Eastern and Western Falkland, South Orkney and South Shetland Islands, with plenty of time at sea. The Falkland islands are home to stunning colonies of albatross (over ten thousand) and the majestic king penguin, as well as several species of seals and whales. This alone makes them a bucket-list destination for wildlife lovers and bird-watchers around the world. The South Orkney and South Shetland islands offer similar treasure troves of wildlife and incredible scenery. Filled with harsh yet beautiful land and seascapes, this itinerary will leave you with incredible photos and precious memories. While we feel that our itineraries capture the very best that Antarctica has to offer, part of the adventure of travel is seeing things from your own unique perspective. The following is a list of passenger-favorite activities that will add to your enjoyment of this incredible continent. Penguin Socializing: Unlike the birds you’re used to locally, the penguins on Antarctica have zero fear of humans and are often all too eager to get to know you better. When you take a trip to a penguin colony, stand (or sit) still for a few minutes – you won’t believe how friendly these adorable birds can be. Travelers routinely come back from Antarctica with tales of these feathered swimmers pecking at their clothing, walking across their legs or even crawling up into their laps for a closer look. Whale Watching: Just like penguins, the whales you’ll see on your Antarctic voyage have no fear of humans. They haven’t been hunted in the area for decades, and are at the very top of the food chain. For travelers, this means incredible sights as whales swim right up to a Zodiac to take a look at the newcomers within. You’ll also see plenty of whale tails as these immense creatures prepare for a deep dive. Sending a Letter From the Bottom of the World: While many of the research stations on Antarctica are very small, others are larger and function much like small towns. If you get the chance, play the tourist and mail a letter from the bottom of the world. Friends and family will enjoy receiving mail from so faraway, but don’t forget to send something to yourself back home – it will become a treasured memento of your frozen adventure. Some of the largest research stations/towns even have tiny gift shops, letting you post a care package from one of the most remote locations on earth. For many amateur and professional photographers alike, Antarctica is a bucket list must-see. It’s not difficult to see why – the colors, light and harsh yet gorgeous scenery is literally unlike anything else on earth. Whether you’re packing a full case of photography equipment or tossing a small camera in your bag, you’re in for a treat. Try to document each stage of your trip, including each stop, icebergs and other shots while at sea, glaciers, all animals you glimpse and the wildly unpredictable weather. If your itinerary takes you to a research station, remember that each is run by a different expedition and country – be respectful and ask before snapping away. Regardless of your skill level, the photos you take are sure to be cherished for years to come. A few fun bits of information to get you excited about your trip! Antarctica Is A Desert: That’s right – the coldest, windiest and highest continent on Earth is also the driest. 90% Of The World’s Fresh water is in Antarctica: Frozen inside icebergs and glaciers, of course. Antarctic Workers Can’t Have Their Wisdom Teeth or Appendixes: In such a remote region, it’s best to eliminate as many potential medical crises as possible. Antarctica Hosts a Fully-Functional Town: Called Villa las Estrellas, this tiny place is Chilean and has its own hospital, school, hostel and even TV, Internet and cell phone reception. The Largest Iceberg in History Originated Here: Larger than the island of Jamaica at 11,000 square miles, this massive hunk of ice broke off Antarctica in 2000. ...But Not Hot: The highest temperature to date was 63.5 F (17.5 C), recorded by Argentinian researchers at Esperanza Base in March 2015. Perhaps one of the biggest rookie mistakes of Antarctic travel is over-packing. While it’s true that you’re packing for what will probably be the coldest vacation of your life, remember that a few quality pieces will do more than several poor-quality ones. Quality in this instance has nothing to do with labels – they don’t impress the penguins! What matters is what your clothing is made of. Since this will be a mostly active vacation, remember that even though it will be cold, you’ll be doing some physical activity, which will heat you up. Dressing in layers is key. Your inner layer should consist of well-made, soft, non-itchy wool long johns (or Janes). Wool is excellent for heat retention, wicks moisture away from the skin and even resists odor. Your best bet for middle layers is man-made fleece specifically made for cold temperatures. It’s lightweight, doesn’t stay wet and keeps the cold out. A coat is a must, but choose carefully. Those with zip-out fleece liners and waterproof outer layers are ideal since they allow for adjustments and keep the water away from your other layers. Choose a coat with a hood, but pack a lightweight knitted or fleece cap as well. Mittens are warmer than gloves, but can inhibit your dexterity – a lightweight pair of each is ideal. Wool socks are great, but fleece options offer a non-itchy alternative. Lastly, remember to pack light. You’ll be taking a smaller plane to Ushuaia, which means a luggage weigh-in. The lighter your actual luggage is, the more you can pack into it. A high-quality duffel bag is ideal, since it offers lightweight durability. Hard-sided cases, with the exception of those used to protect delicate camera equipment, are unnecessarily heavy and should be avoided if possible.